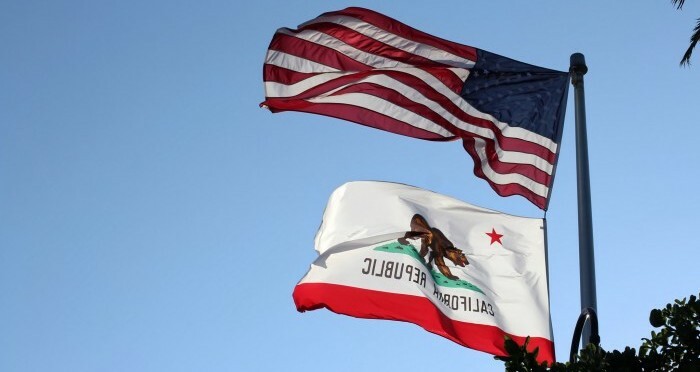 California made history a decade ago this month by being first in the nation to pass legislation (AB 32) putting an absolute limit on carbon pollution through 2020. The California Legislature made history again last week by extending and strengthening those limits to 2030 (SB 32 and AB 197). SB 32 requires California to reduce pollution 40% below 1990 levels by 2030 – as ambitious as Europe’s climate policies – and provides the flexibility to use a variety of tools to accomplish this goal. The governor has announced he will sign both bills. Legislators also passed a spending plan yesterday that will direct approximately $900 million in cap-and-trade proceeds to reduce pollution and benefit California communities, especially the most disadvantaged. Another bill passed yesterday, AB 1550, increases the commitments of those disadvantaged communities and makes low-income communities beneficiaries as well. California’s decision to set these new targets and establish this new spending plan was not just based on hope and necessity, but on a 10-year foundation of success and a solid understanding that this next set of targets are ambitious but achievable. Here’s why California’s climate program has been a success, and why the new long-term emissions reduction target will help the state continue to thrive. 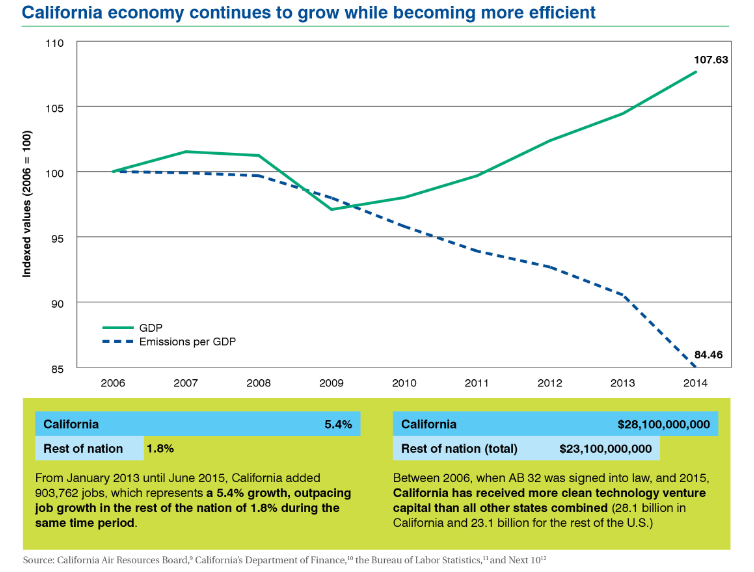 California’s carbon pollution is declining. AB 32 requires California reduce its greenhouse gas emissions to 1990 levels by 2020, a reduction estimated at about 15% below where emissions would have been without regulation. To meet these reductions, California has adopted a suite of climate policies anchored by a cap-and-trade program, which puts an absolute limit on carbon pollution, while providing cost-effective options for businesses to meet their reduction obligations. California’s carbon pollution has steadily declined in the last 10 years. In the first two years that the cap-and-trade system was in place (2013 and 2014), California’s carbon emissions declined by an amount equivalent to taking over 1 million passenger vehicles off the road for a year. California is ahead of schedule in meeting its 2020 goal. Emissions have been below required levels in every year we have data for. Regulators expect that in 2020 California will exceed its own requirements by an amount that is equivalent to taking 3.3 coal burning power plants off-line for one year. In the first two and a half years of California’s groundbreaking carbon market, the state added over 900,000 jobs, a growth rate that eclipsed the national rate. Carbon markets are going global. The impressive outcomes from the first decade of California’s AB 32 implementation have attracted numerous partners. States, provinces, cities and countries are taking note and action. At the Paris negotiations at the end of 2015, California Governor Jerry Brown showcased a “Memorandum of Understanding,” bringing together states and regions committing to reducing greenhouse gas emissions to at least 80% below 1990 levels by 2050, or to less than 2 metric tons per capita by 2050. Over 100 states, provinces, and cities, representing one quarter of the world economy, signed on the agreement. In addition, California is partnering directly with several Canadian provinces to implement joint cap-and-trade programs. It has also established an agreement to share information and work with China and Mexico on their carbon pricing efforts. 2030 target is ambitious but achievable. The world will be watching whether California can repeat its gold medal performance under these new targets, and all indicators seem to point in the state’s favor. Currently, about 12% of the world’s greenhouse gas emissions are covered by carbon pricing. More details about this map can be found in the Doubling Down on Carbon Pricing report by EDF and IETA. There are a number of signs we are entering a golden age for carbon pricing. Perhaps the most important one is that many countries around the world are currently considering carbon pricing policies to achieve their greenhouse gas emissions reduction goals. A price on carbon gives emitters a powerful incentive to reduce emissions at the lowest possible cost, it promotes innovation while rewarding the development of even more cost-effective technologies, it drives private finance, and it can generate government revenue. This spring, World Bank Group President Jim Yong Kim and International Monetary Fund Managing Director Christine Lagarde convened the Carbon Pricing Panel to urge countries and companies around the world to put a price on carbon. On April 21, 2016, the Panel announced the goals of doubling the amount of GHG emissions covered by carbon pricing mechanisms from current levels (about 12 percent, as illustrated in the map below) to 25 percent of global emissions by 2020, and doubling it again to 50 percent within the next decade. EDF and the International Emissions Trading Association (IETA) worked together to explore a range of possible, though non-exhaustive, scenarios for meeting these goals. You can see the results in a series of maps which show how carbon pricing can be expanded worldwide. Achieving the Carbon Pricing Panel’s goals will be a crucial stepping stone to realizing the ambition of the Paris Agreement, which aims to hold the increase in the global average temperature to well below 2°C above pre-industrial levels. Meeting that objective will require countries not only to implement the targets they have already announced, but to ratchet up their efforts dramatically in the years ahead. Carbon pricing will have to play a key role in that effort. Explore how the world can reach the Carbon Pricing Panel’s ambitious goals. California drivers, communities, and businesses have endured degraded roads, unending traffic, choking pollution, and limited transit options for years. As the population continues to grow, so too will the problems of the transportation sector (and many other sectors) unless major investments are made. Given the profound need to clean-up California’s infrastructure, Tuesday’s $390 million expenditure award by the California State Transportation Agency (CalSTA) and yesterday’s proposal by the State Senate to spend $1.2 billion of available dollars generated by California’s cap-and-trade auctions are important steps in reaching communities that need these upgrades most. What these critical spending plans also clearly demonstrate is that cementing 2030 pollution reduction targets into statute ensures continued investment in reducing emissions and benefiting communities. It’s been no secret that a political debate is underway in Sacramento over setting long-term climate pollution targets for California. Why? Setting long- term policy will support the state’s low-carbon, prosperous economy. This process is important not just for climate change, but to ensure growth and stability in the business and investment climate that will enable our economy to flourish. Long-term climate policy – including cap and trade and a suite of other measures – aimed at cutting pollution has been a boon to the state over the past decade, allowing the economy to flourish, resulting in massive venture capital investment, innovative products, and reduced pollution. Within the cap-and-trade program, auctioning emissions credits has become an integral way to make the program work, though the purpose has never been to raise and maximize revenue. As a result, within the existing landscape, the auctioning of permits has allowed for additional environmental improvements through investments such as the 14 different transit projects just announced. Similarly, and as outlined by the State Senate’s proposal, the cap-and-trade program can drive myriad other investments that cut climate pollution, such as traffic flow improvements, low- carbon vehicles, energy efficiency, urban greening, and sustainable community development. When completed, the 14 projects funded by the CalSTA will benefit nearly every major urban area in the state, transcending political boundaries, bridging economic divides, cutting air pollution, growing jobs, and reducing congestion. And, with 30 million cars on the road consuming gas at some of the highest prices in the nation, improved transit and transportation systems simply give drivers more options – saving money and creating better mobility in the long run. Unfortunately, California has a far greater need than what this $390 million can meet (the California Transit Association projects a total need of nearly $175 billion), or what the $1.2 billion State Senate proposal would deliver. Fortunately, policies like cap-and-trade work to cut pollution through a declining cap on carbon and a price on carbon, resulting in innovation and investments in regulated businesses. As permits are auctioned, targeted investments of proceeds generated through those auctions can also produce air quality benefits while leveraging private capital and inspiring innovation. Over the next couple weeks, Sacramento lawmakers can positively impact the long-term certainty of California climate policy and its ability to drive pollution reductions and ensure vital investments in areas like transit and improved transportation systems. The current expenditure plans and proposals — along with several billion dollars that have already been allocated — illustrate how programs such as cap and trade create real investment options that benefit people, communities, and the environment across the state.